« Happy New Year 2014 with a ….Warm Rice Cake! I was working at the Children’s Hospital, Hematology Research Laboratory, as a Medical Technologist in Los Angeles, California…..when Max Fields, a co-technologist came that morning and brought a “Cream Cheese Pie” for all of us to taste. He said he found the recipe in one of the magazines that advertized Philadelphia Cream Cheese. It was 1967. 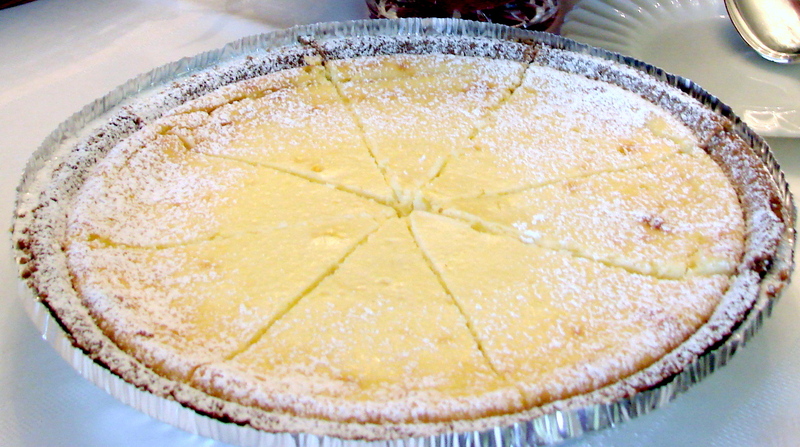 With the first bite of this Cream Cheese Pie….I was hooked. On the way home from work I bought the ingredients and made that delectable dessert to treat my parents with an after dinner desert. I have made this desert many, many times since…but, the first time I made it my parents asked me to make it on the weekend since we were having dinner guests who were “American” and thought that they would love to see that we are on the way to integrate into American life…You see we had come to the US a few years pryer and most of our friends had been other refugees from Europe. This particular couple had us over to their house and we wanted to reciprocate their kindness by having them come to dinner to our home. The husband was full of praise for my mother’s cooking and could not say enough about the “cream cheese pie” when his wife got terribly upset and jealous and created a scene at the table by accusing him not ever telling her that her dinners were outstanding as well… You can imagine how we felt…and the dinner ended badly and sadly ended our beginning friendship with an American couple. We never saw them again. Then a few years after that unfortunate experience, I married and we moved to Baltimore, Maryland. Our son was in middle school when we sponsored five Japanese La Cross players. They were the same age as our son and were wonderful young boys. They were to stay with us about a week or so. The second day I asked how they liked the food that they were having at school when they reluctantly told us that they did not like what they were getting at the cafeteria. So I cooked them a big pot of rice….they devoured it in five minutes…then I thawed some chicken soup….which they drank right out of the bowls…and that too was gone in less then five minutes. I told them that I would make some dessert for them after they got their showers. 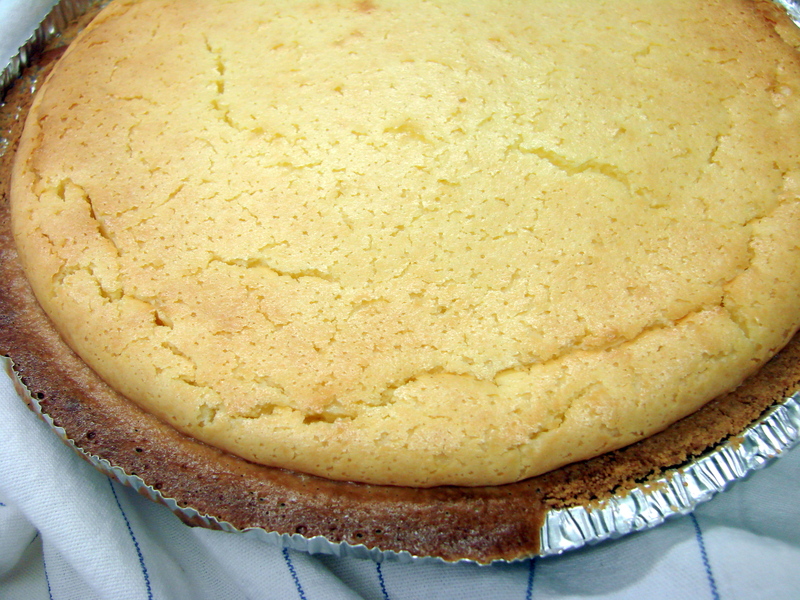 I got the cream cheese out of the refrigerator…luckily I had some bought graham cracker crusts in the pantry…and whipped up the OLD CREAM CHEESE PIE. It takes only about 30 to 40 minutes to bake. I was just taking the pies out of the oven when the boys came down to the kitchen all clean and smiling. They were ready for the dessert, and could not wait to have them cooled down. They ate the pies within minutes and their smiles became even brighter. They loved it….I did mange to get a bite and discovered that it was even more delicious warm than when it is served cold. I also do not add the sour cream topping…my “Cream Cheese Pies” are simple and baked until they are slightly browned and cracked on top. Two years ago I made them for the…. 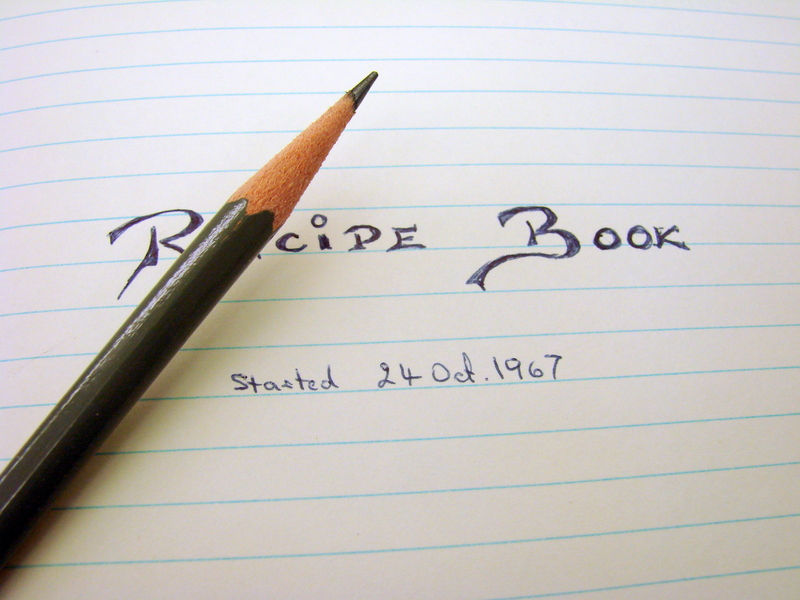 Here is the original recipe for the…. I usually buy a prepared Graham Cracker Crust in a foil pan at the store….and make the filling with a little more cheese, more eggs and more sugar than the original recipe calls for. 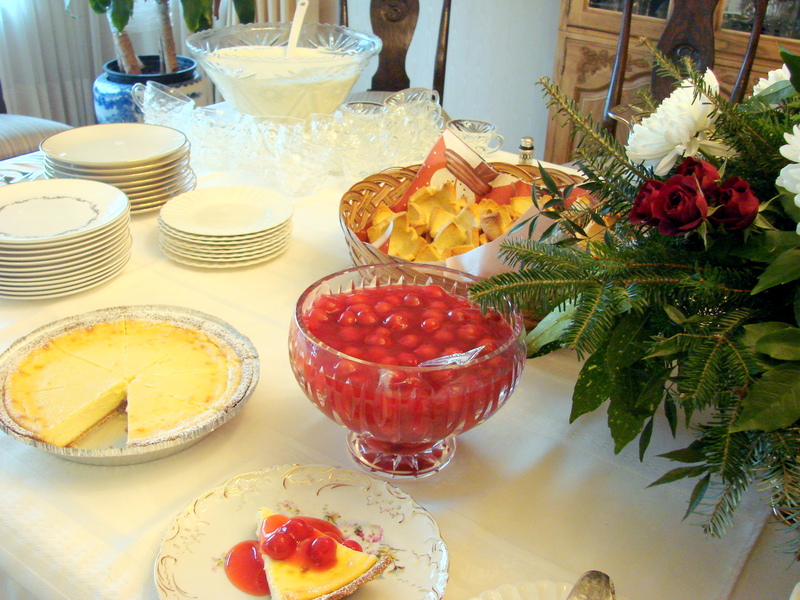 Also I do not make the Sour Cream topping….and I serve it still warm with a dusting of powdered sugar. 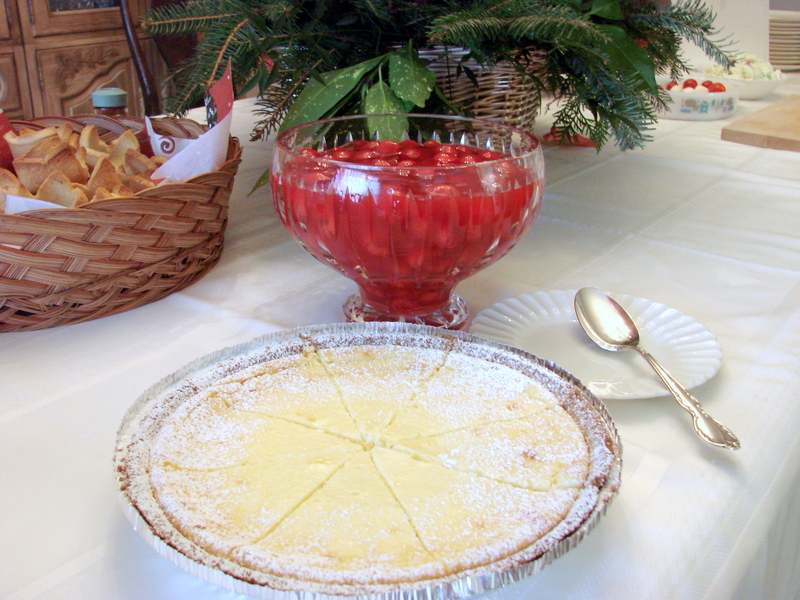 The Cherry pie filling…is intensified with a tsp or so of either rum or brandy….which enhances every bite with an extraordinary flavor and delectable experience. Mix all the ingredients well and pour into a prepared Graham Cracker crust. Bake in a preheated oven at 350 F….for about 40 minutes or until the top begins to rise and brown and shows several cracks around the edges. The cracks and puffed top will settle down as the pie cools. Serve it when it still warm….warmer than room temperature…with a little Cherry Pie filling…that has had some Brandy or Rum added to it…and a dusting of powdered sugar…. Hope you enjoy this desert as much as I do. When did you start making…. 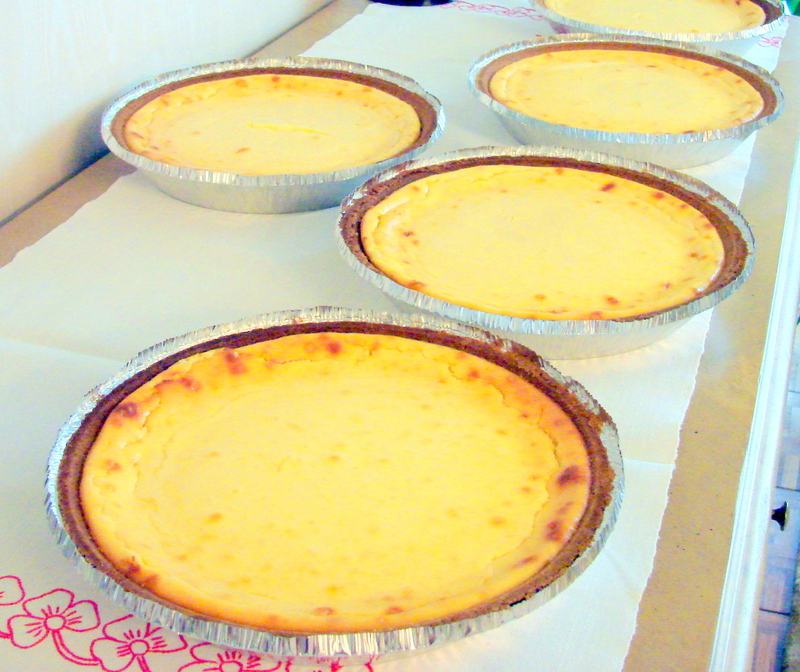 Cheese Cakes…or Cream Cheese Pies? 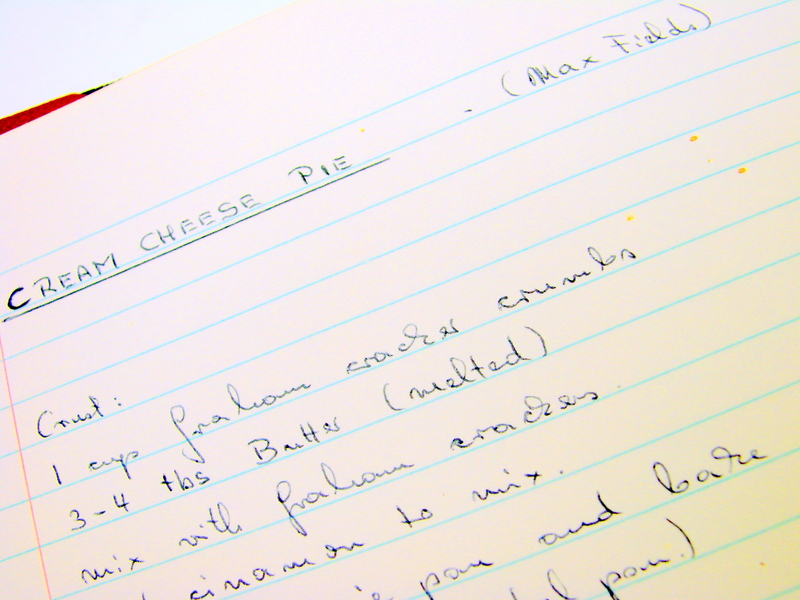 Maria, cheese cake recipe sounds great. Never tried mine warm. My recipe is exactly like yours except I use 4 extra large eggs and do not add almond flavoring. I bake for 40 minutes and then leave in oven for 2 hours or overnight. p.s. keep warm. I am making vegetable soup in a few minutes. p.s.s. loved your gingerbread house article! I love the idea of serving the topping on the side. Makes it so perfectly customizable! 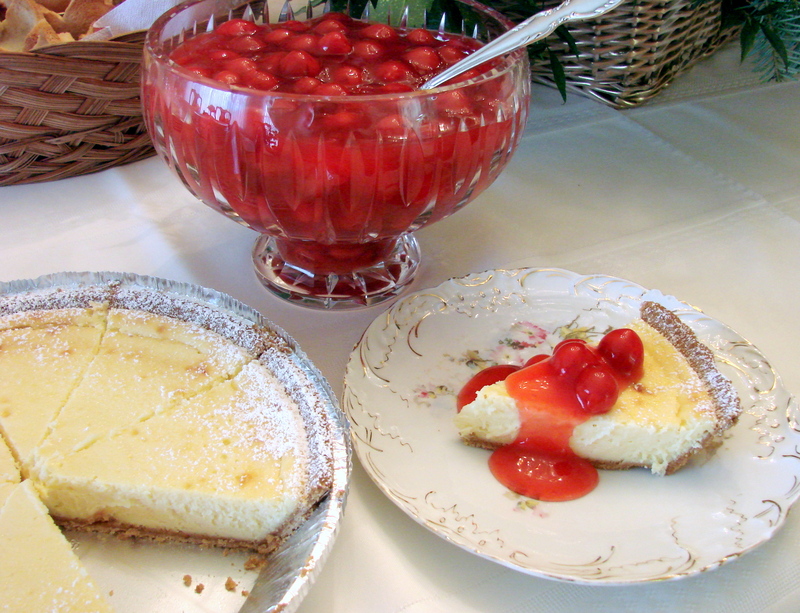 I love NY style cheesecake, but your recipe sounds yummy. I’m going to have to give your recipe a try. Happy New Year! Oh this was Delicious!! We actually liked it cold, but what a Treat!! Thank you So much and we plan on making it again! Just wanted to let you know that we made it again and we did something different with the crust. Instead of gram crackers, we used 3/4 cup of crushed Amaretti cookies with 1 tablespoon of melted butter. OH BOY!! You really should put a warning sign on this recipe. Caution! This pie has some serious side effects. Thank you again for posting this!!! Looking forward to being a “repeat offender” with this recipe!!! Funny story about that American couple – I would say, good riddance, you don’t want to be exposed to people exchanging poisoned barbs across your dinner table.